Earlier this year, the Planetary Science Decadal Survey recommended that NASA consider sending a mission to the planet Uranus. With all the attention paid to Mars, Jupiter and even poor little Pluto, what's the draw in going to Uranus? Lots, says Mark Hofstadter of NASA's Jet Propulsion Laboratory in Pasadena, Calif.
"Uranus is a type of a planet that we know very little about," Hofstadter said. "Thirty years ago, we thought Uranus and Neptune were just smaller versions of Jupiter and Saturn." Current tallies of exoplanets suggest that ice giants are more common in our galaxy than the larger gas giants. "We'd like to study our local examples of this common type of planet," Hofstadter said. If you had to pick one, Uranus is probably the better destination than Neptune. It challenges scientific models with its unique rotation and puzzling internal structure. Moreover, planet number seven is easier to get to than planet number eight. Hofstadter is one of a group of scientists exploring the potential of sending an orbiter to Uranus. One particular proposal, called Uranus Pathfinder, was recently considered by the European Space Agency (ESA). "Both the European and American sides are convinced that an orbiter is needed rather than a flyby," said Chris Arridge of University College, London, principal investigator of Uranus Pathfinder. "But then costs rear their ugly head." 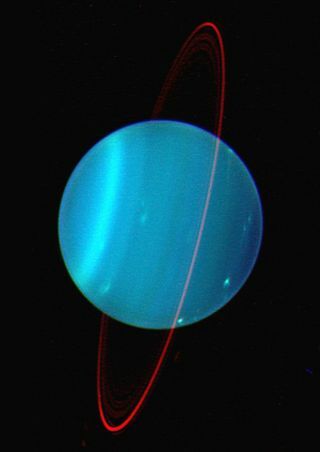 Uranus Pathfinder made it far in the selection process for ESA's next round of medium class missions, but ultimately it was passed up. "The project is by no means dead," Arridge said. "Interest is building to go back to Uranus." In 1986, the Voyager 2 spacecraft flew by Uranus on its way to the edge of the solar system. The pictures that were beamed back showed a uniform blue ball that almost seemed boring in comparison to the rich, colored surfaces of Jupiter and Saturn. But Uranus's featureless façade hides the strangest interior in the solar system. The first striking aspect of Uranus is the way that it's tipped over on its side, with its rotational axis lying in the disk of the solar system. Scientists speculate that a giant collision or two knocked Uranus over long ago. The odd rotational orientation may have some effect on the ice giant's internal dynamics. Uranus is the only planet we know of that can't be represented by a simple three-layer model comprised of a rocky core, a water-rich mantle and a gas atmosphere. Inside Uranus, these different phases of matter must be mixed together in some complex way. To sort out this internal structure, Hofstadter, Arridge and their colleagues want to send an orbiter to map the gravitational field around Uranus. In addition, remote measurements in microwave and infrared wavelengths could fill in details of the atmospheric composition, like the abundances of different ices. A better understanding of the internal structure may help explain Uranus's bizarre magnetic field, which is tilted at 60 degrees with respect to the rotational axis. This would be like having Earth's magnetic pole going through New Orleans. "It is not something we understand very well," Arridge said "If we can study it more closely with magnetic field measurements, we might learn something about how planets produce magnetic fields in general." Because of Uranus's odd rotational orientation, winters and summers are literally night and day apart. During a quarter of the planet's 84-year orbit, one hemisphere monopolizes all the sunlight, while the other is completely dark. This was how Voyager 2 saw Uranus, with its southern hemisphere in full summer sun. And this might be why the planet looked so bland. More recent images taken with ground telescopes during the southern autumn season have discovered clouds and huge wind storms traveling as fast as 500 mph (805 km/h). "Uranus is more active than the Voyager images implied," Hofstadter said. Scientists are curious to study this in more detail. Could it be that Uranus's strange internal structure is blocking the flow of heat to the surface on a continual or seasonal basis? Or perhaps the heat was "knocked out" during the supposed collision(s) that toppled the planet over? An orbiter mission could get to the bottom of this by measuring temperature variations on the surface that would relate to heat transport. Ironically, the thermodynamics on super-cold Uranus might tell us something about "hot Jupiters," which are exoplanets in extremely tight orbits around their host stars. The outer temperature of a hot Jupiter is assumed to be controlled by the incoming stellar radiation. The planet is not the only thing to visit. Scientists are also interested in the rings and satellites around Uranus. Voyager 2 only saw one side of these moons, since they were all turned like Uranus with their poles toward the sun. An orbiter mission would give a much more complete picture of the Uranian satellites. "The Cassini mission has revealed a lot about Saturn's moons, and I think just as rich a return awaits us at Uranus," Arridge said. One of the more intriguing moons is Miranda. Its surface is carved with canyons that suggest intense geologic activity. "It looks like pieces of different puzzles stuck together," Hofstadter said. The moon also boasts the highest cliff in the solar system, Verona Rupes, which has a drop-off of more than 3 miles (5 km). Scientist have suggested that the two largest moons, Titania and Oberon, might have liquid oceans below their crusts. Only closer observations would be able to say for sure. Intermixed with the moons are 13 narrow rings, which are so faint they were only detected by accident in 1977. The Uranian rings are distinct from the broad, bright rings of Saturn, so they offer a nice counterpoint in trying to understand the general physics of ring formation, Hofstadter said. Although the chances of life finding a niche somewhere around Uranus are unlikely, astrobiologists are interested in the role that Uranus and Neptune might have playedin the formation of the terrestrial planets. The so-called "Nice model" (after the city in France where it was first discussed) posits that the late heavy bombardment may have been initiated around 4 billion years ago by a migration of Uranus and Neptune away from the sun. Such a planetary shift could have scattered comets in the outer solar system, putting some of them on collision trajectories with Earth and the other terrestrial planets. If the late heavy bombardment did originate this way, then it could explain where much of our water and atmosphere may have come from. "Did the arrival of these icy comets help to make Earth habitable?" Hofstadter wonders. A Uranus mission could test the Nice model by carrying a probe, which could be dropped into Uranus's atmosphere. The probe could measure the abundances of certain noble gases, which can tell scientists at what distance from the sun Uranus formed. If this data were to say that Uranus was born at a position closer to the sun than it currently resides, that would support an earlier migration. It would also help to explain why Uranus and Neptune are larger than certain planetary models predict. The best time to launch a mission to Uranus would be sometime in the early 2020s, when the planet alignment would be prime for such a long journey. Depending on the chosen propulsion technology, the trip would take roughly 10 to 15 years. Although most of the technology is at hand, Arridge says there are questions about how to supply electric power to the orbiter when it is almost 3 billion kilometers from the sun. Solar panels would need to be an unwieldy 4,305 square feet (400 square m) in size. Radioactive power is the alternative, but plutonium is becoming harder to come by. A bigger issue is the cost. The ballpark estimate for a Uranus mission is between $1.5 billion and $2.7 billion, according to Hofstadter, who was lead author on a recent mission study. This price tag puts it in the territory of a flagship mission, the largest and most expensive missions in the NASA rubric. In March 2011, the National Research Council released its vision for Planetary Science in the coming decade 2013-2022. This Decadal Surveyranked the priorities for flagship missions and gave the two top spots to a Mars sample return mission (MAX-C) and a Jupiter Europa Orbiter (JEO). For the third highest priority, the Survey chose the "Uranus Orbiter with Probe". At the end of this past July, NASA responded to the Decadal Survey's recommendations. There was agreement over the prioritizing of flagship missions, but under the current fiscal challenges, "it is unlikely that NASA can execute the Survey's recommendation to initiate the Uranus Orbiter with Probe mission along with MAX-C and JEO in this decade," the response read. NASA will continue studying a Uranus mission for the future. There is some talk of perhaps a collaboration between NASA and ESA to pool their resources, Hofstadter said. If not this decade, then maybe next. Uranus will wait, even if Earth-bound scientists have trouble doing so. "I'm 48 years old, so the clock is ticking," Hofstadter said. This story is presented in cooperation with Astrobiology Magazine, a web-based publication sponsored by the NASA astrobiology program. Follow SPACE.com for the latest in space science and exploration news on Twitter @Spacedotcom and on Facebook.